Who would you put your money on? A Formula One team that had a car linked up with all the monitoring equipment and test analysis or a team that just put the car together and then relied on the driver to say if something was wrong? Processes are the same and if you don´t measure the performance of a system it is difficult to know if it is running in optimum condition. For the paper machine dryer section it is particularly difficult to measure the necessary parameters because of the rotating equipment and because of the harsh environment (hot and humid). However SWEMA from Sweden have a range of products specifically designed for use around paper machine dryer sections. PES is the distributor for SWEMA in México because we know the importance of regular measurement of the dryer system performance. The SWEMA product range can measure the two important parameters, the cylinder surface temperatures and the pocket humidities. There are also options for measuring air flow rates if further investigative analysis is required e.g. if the pocket humidities are high then the exhaust air flow rates can be checked. PES can model the performance of the dryer section and benchmark it for various grades. A monitoring system can then be set up and the measured parameters, cylinder temperatures, pressures, pocket humidities, etc. checked against the benchmark. PES can provide a service for a system 'health check' on a quarterly basis provided the mill can send the measured data, hence the need for the SWEMA equipment. The above profile shows how a problem with the system can be detected. 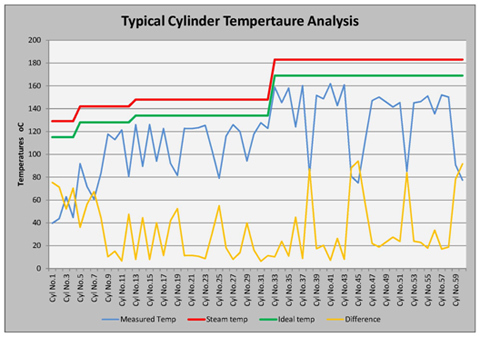 Ideally the cylinder surface temperatures should be around 20°C below the steam temperature. Any variation from this, suggests problems with poor condensate removal. In an extreme case such as above, the solution would be to invest in a rebuild of the steam and condensate system. But if it is just one or two cylinders with problems then it is likely to be related to siphon or rotary joint problems. But even after a rebuild of the steam and condensate system, regular checking of the dryer section performance is highly recommended. SWEMA have the best range of products for this purpose.